The pin that corresponds to the reading of the wiper is pin B. A and C are connected to the ends of the resistor, being pin A the initial position and C the final position. When pins A and B or C and B are connected, the current goes through the wiper (blue line). 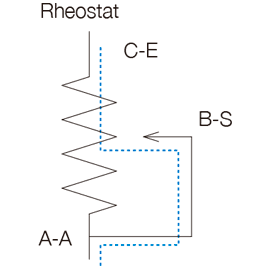 a lower resistive value than the whole resistor would (we say it is used as variable resistor or rheostat). The output is measured in ohms. When a voltage is applied between the ends of the resistor (A and C), the current goes through the resistor, not the wiper. 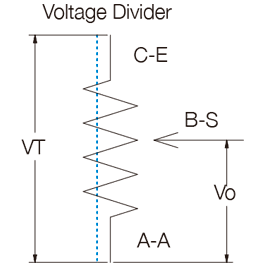 The wiper sees a proportional share of the voltage applied between the ends (we say this is a Voltage Divider). The output is a voltage, measured in V.
It is the resistance found between the input terminal and the wiper when the latter is positioned to give the maximum value. Noise is any variation in the output signal that does not correspond to a similar variation in the input signal. It appears in the contact point between the resistive element and the wiper. It is measured in Ohms. This noise can also be measured as “contact resistance variation” (CRV), which is expressed in the percentage of change between the initial resistance and the value of the resistance after a test. It is measured statically and dynamically. ACP’s potentiometers have less than 5% CRV. The standard values are as follows, although values out of range can also be studied. ACP can also provide with tapers with different slopes, with areas with constant value or jumps, according to customer’s specifications. Special tapers can be combined with physical detents to match the areas where the customer wants to guarantee a constant value with a particular angular position. This is particularly suitable in applications which can benefit from a feeling of maintained control over the position, for example, regulation of temperature or speed. 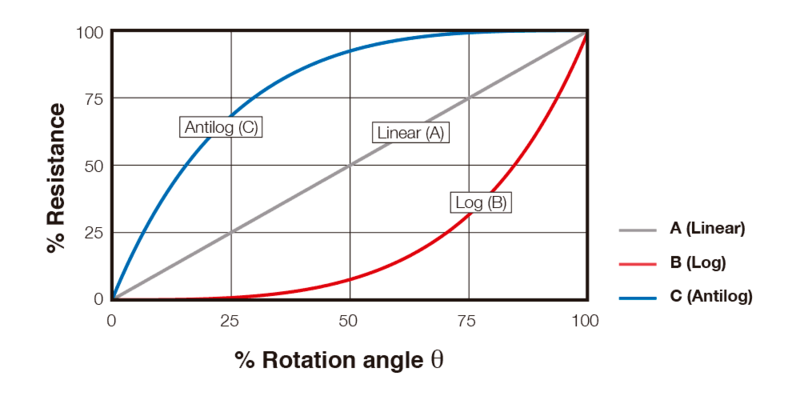 The term “linearity” implies that the real law obtained from plotting angular position vs voltage output is compared with a straight line. It is the maximum vertical deviation of the real law from the straight reference line chosen to best minimize the distance from the real line in any position. It is expressed as a percentage of the total voltage applied. In the graph below, “K” would be the maximum independent linearity and “k” the line with which the real law is compared. It is the maximum vertical deviation of the real law from the straight reference line that runs through specified minimum and maximum points. These points would be zero and 100% of the maximum applied voltage. 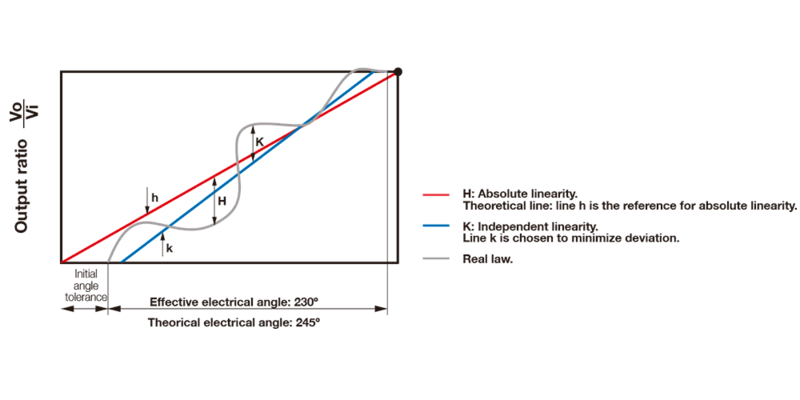 In the graph below, “H” would be the maximum absolute linearity of the real law and “h” the theoretical line with which the real line is compared. 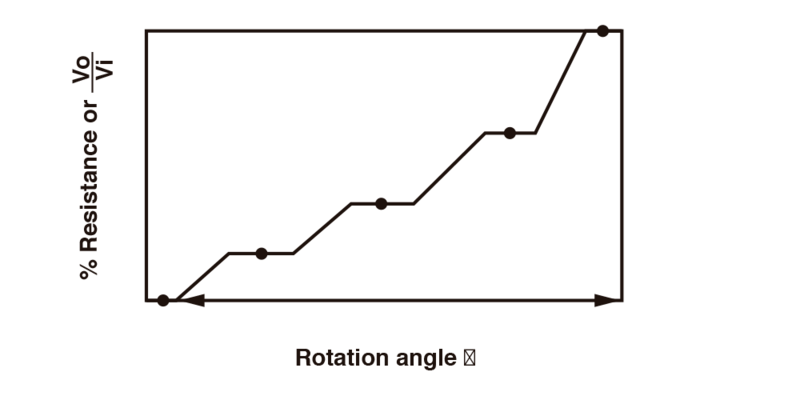 When some customers are looking for correspondence of angle and value, this is the concept to consider. Maximum temperature of soldering tools: 280ºC Temperature Ramp-up: 2-3ºC / s. Preheating stage: Max 100ºC; 30-60 s.
Time: 3 s. max. Over 220ºC:<40 s. Temperature Ramp-up:1.2-2.5ºC/s. passed IEC 60068-2-58 tests. Time within +0º-10ºC of peak: 10s. (*) For other information on soldering conditions, please, contact us.